Out of the jungles East Borneo in Indonesia comes the fire that fuels Asia’s burgeoning economies: coal. Miners dig deep open pits, clearing forests and farmlands to extract coal from thick black seams, which is then crushed and loaded onto trucks and barges for shipment to China, India, Japan and other destinations in Asia. Indonesia, itself a large and growing customer, produced 421 million metric tons last year, according to official government figures, with about 350 million metric tons exported to feed the region’s growing demand for energy. India and China are the top two buyers. 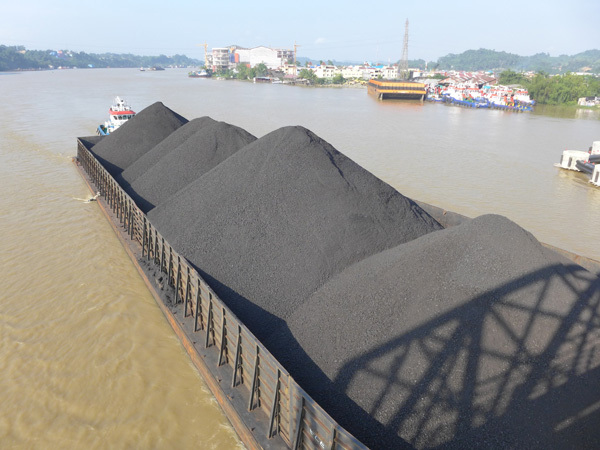 A barge is loaded with coal at a loading terminal on the Mahakam River, near Samarinda, East Kalimantan. Photo by David Fogarty, (August 2014). Output has tripled within a decade and Indonesia is now the world’s top exporter of thermal coal used in power stations, earning the government billions of dollars in royalties. Coal taxes are a vital source of revenue, helping plug a budget deficit running at about 3 percent of GDP. But with this success has come a multitude of ills, including large-scale deforestation, water pollution, conflict with local and indigenous communities and health costs from coal dust. Add to this corruption, tax evasion, illegal mining and illegal exports, which are costing the government millions of dollars in revenue. The industry is becoming a threat to itself, the economy and the national and global environment. In response, the central government has launched a major drive to clean up the sector and weed out the worst players, mostly small mining companies, but it remains to be seen if the authorities can claw back greater control. The aim is to limit the sector’s rapid growth and to impose tougher enforcement of regulations, crucial if the government is going to able to carefully manage the expected increase in demand for Indonesia’s coal. 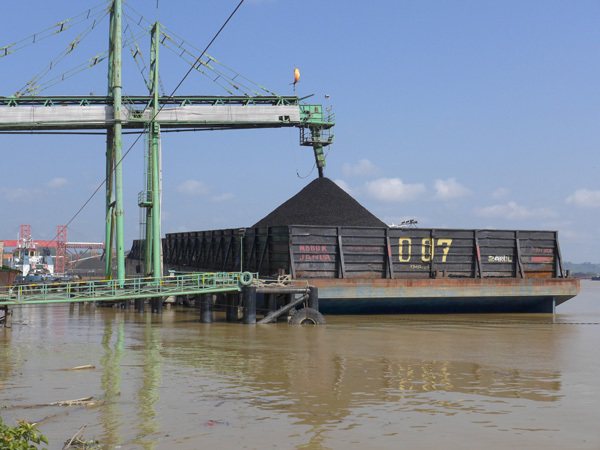 About half the coal comes from the resource-rich province of East Kalimantan and to get a sense of the scale of the industry, you only need to stand on the main bridge across the Mahakam river, which flows through the provincial capital Samarinda. Barges the size of an Olympic swimming pool flow past every few minutes, pulled by tugboats to bulk carriers waiting along the coast nearby. Each barge carries about 8,000 metric tons of coal, most loaded up river from myriad coal terminals that jut out into the river. Samarinda is ringed by coal mines and vast coal stockpiles that constantly feed the barges via conveyer belts. Coal barge on the Mahakam River, Samarinda, East Kalimantan. Photo by David Fogarty, (August 2014). This is a nation in a hurry, and resource extraction has been the main driver of economic and export growth. As Indonesia’s oil reserves dwindle, coal’s importance grows. “The idea is that we have to consider our energy security. We consider that coal is our prospective energy in the near future,” said Bambang Tjahjono, the director of coal business supervision at the Ministry of Energy and Mineral Resources’s Directorate-General of Mineral and Coal. About 60 million Indonesians are not connected to the grid and the government is pushing rapid investment in coal-fired power stations to fix power shortages and to drive strong economic growth. Like the resource booms of oil and gas, logging and oil palm before it, coal is regarded as a quick and easy fix and a cash cow, with environmental concerns often secondary. “Indonesia as a whole may currently have a different level of interest on the environmental impact compared to some other jurisdictions,” said Sacha Winzenried, a senior adviser in energy, utilities and mining for PwC, the global business services firm. According to NGOs, the sector needs to be reined in. They point to the threat from burning coal in driving climate change. They say Indonesia needs to focus more on renewable energy investment and curbing conflict between mines and local communities, whose land is increasingly under threat. To clean up the sector, the government has called in the nation’s Anti-Corruption Commission, or KPK, which is leading a sweeping review of mining permits. “The focus for KPK is to increase the government revenue and avoid the leakage of the revenue,” said Tjahjono in a recent interview at his Jakarta office. He also hopes it will lead to better enforcement of environmental regulations. In another major initiative, new trade rules that took effect Oct. 1 will target illegal coal exports. Combined, Tjahjono hopes both initiatives will lead to a leaner, more tightly regulated sector. For NGOs, the crackdown is essential but some fear it won’t head off looming environmental and social problems because of the large number of mines and permits. 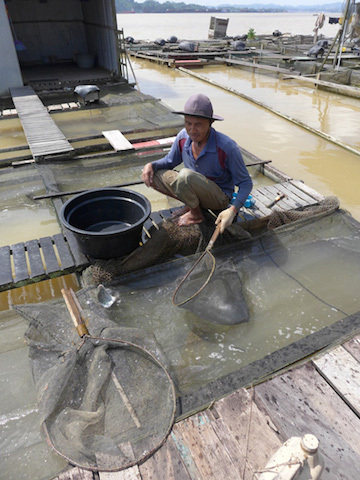 Rumansi, a fish farmer on the Mahakam River, near Samarinda, catches nila fish, an important source of income for him. The fish farm is out the back of his house and is near a coal loading terminal. He says his monthly catch has dropped by about 30 percent and receives about $21 a month in compensation from a local coal mine for coal dust pollution. Photo by David Fogarty, (August 2014). “I think there will be more problems because half the mining permits will be finishing up in the next 10 or 15 years. Our prediction for 2020, we will have very serious environmental damage. That’s only one problem. It will also be with other problems, such as health problems and land conflict,” said Merah Johansyah, who leads the East Kalimantan branch of Indonesian mining NGO Jaringan Advokasi Tambang, or JATAM. Coal dust from trucks and barge-loading are common problems, JATAM and other NGOs say. Villagers who complain are sometimes paid “dust money” as compensation. Just outside Samarinda on the Mahakam River, Rumansi is catching fish in his fish farm, a collection of pens that stretch into the river at the rear of his home. Nearby is a coal loading terminal. Rumansi, who says he’s about 35, says his catch has dropped by about 30 percent in recent years and the nila fish he breeds are maturing more slowly and more are dying. He blames water pollution and coal dust. The local mine pays him 250,000 rupiah (about $21) per month in compensation, which he says is a fraction of his actual losses. According to the Ministry of Energy and Mineral Resources in Jakarta, there are 3,922 permits for coal exploration, operations and production across the country. Most are in Kalimantan and Sumatra, which contain the majority of Indonesia’s coal reserves. The central and local governments do not have the resources to actively monitor these permits, analysts, NGOs and the ministry say. “There are a lot of mining companies in this place and the administration is not nearly as strong as, say, Australia or the United States,” said a senior mining executive on condition of anonymity. Of the total permits, 1,461 are listed as non-clean and clear because of irregularities, such as mines overlapping with other mining or agricultural concessions, the ministry says. It launched its own permit review programme five years ago to clean up the sector, with mixed results. A province-by-province analysis of coal permits shows they totalled just over 21 million hectares in 2013, roughly the size of the U.S. state of Kansas or three times the size of the Republic of Ireland. While many of these will never become mines, the scale highlights the risk of social conflict and environmental damage in a country with 250 million people, many of whom rely on farmland, forests and rivers for their livelihoods. Data from the Indonesian Ministry of Energy and Mineral Resources (2013). Background photo by David Fogarty. Click to enlarge. A large portion of the problems stem from the district level. Regional autonomy laws in 2001 gave districts much greater powers, and this triggered the explosion of mining permits. In East Kalimantan, district heads, called bupatis, have issued about 70 percent of all mining permits, with the money boosting district revenues, funding the bupatis’ re-election campaigns and, according to recent corruption cases, for personal enrichment. “One of the top challenges for the industry is the coordination between government departments and between the central and regional governments, because this is one of the keys to sustainable development that meets the needs of investors,” said Winzenried in his Jakarta office. Regional government mining offices often lack the resources, the budget or the will to up-skill themselves, he added. The lack of oversight means the central and local governments do not know the exact number of mines that are producing coal in Indonesia – roughly estimated at 400. And no one knows how much coal is illegally produced and exported. While 421 million metric tons is the official production figure for 2013, the ministry says it is closer to 500 million because of 50 million to 60 million metric tons of what it calls “missing exports.” Others say illegal production is much higher. 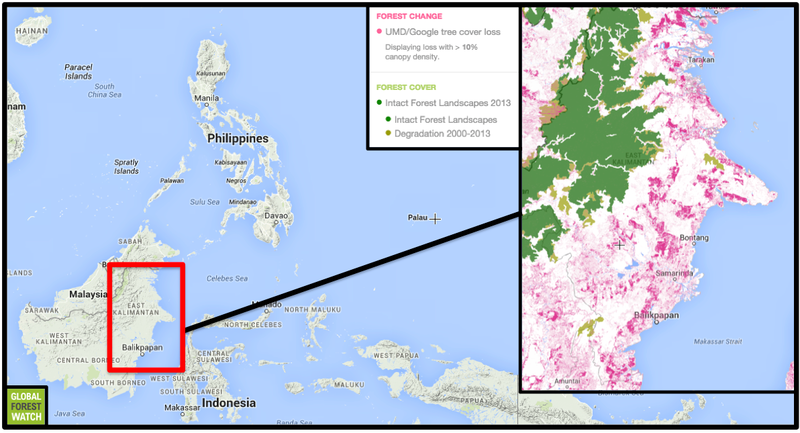 Data from the Indonesian Ministry of Energy and Mineral Resources (2013), and Google Earth. Background photo by David Fogarty. Click to enlarge. 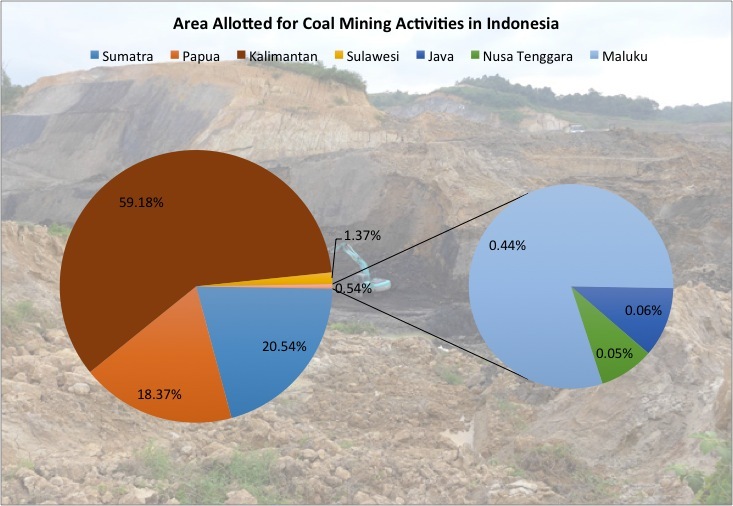 Data from the Indonesian Ministry of Energy and Mineral Resources (2013), and the Indonesian Central Statistics Agency. Background photo by David Fogarty. Click to enlarge. Not all coal mines are the same and most of the problems stem from the multitude of smaller, loosely regulated mining outfits. These operate for relatively short periods, have little regard for local communities and often abandon their mining pits once they cease operation, government officials and NGOs say. Most of Indonesia’s coal is produced by a handful of large companies that have direct contracts with the central government. Indonesian mining giants PT Adaro and PT Kaltim Prima Coal have long-term contracts and were responsible for about a quarter of Indonesia’s total official coal production last year. Their production and operations are carefully monitored and reviewed every year by the ministry. 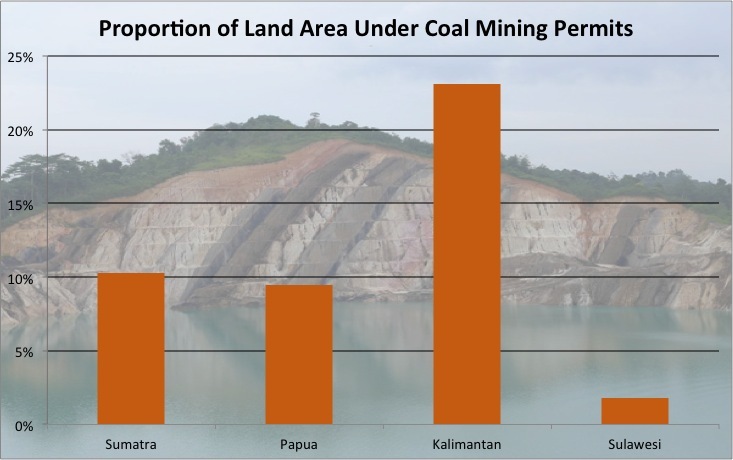 In total there are fewer than 80 direct coal contracts of work in Indonesia, according to government figures. They also pay higher royalties than companies granted mining permits called IUPs. “Within Indonesia, you can see a marked difference between what may be called the formal sector and the other less formal end of the markets. And where there are clearly environmental issues is with the less regulated sector, either illegal miners or the very small players,” said Winzenried. The senior mining executive said large mines tended to have a much more structured, long-term approach to mining and a much greater interest in environmental and social impacts. “The smaller areas do not lead to large-scale mining and tend to be more destructive in the sense that you dig out the coal [and] dump the overburden, but there’s no great incentive to maintain that because you’ve got a relatively limited life [for the mine],” said Winzenried. According to JATAM, some of the larger players aren’t perfect. 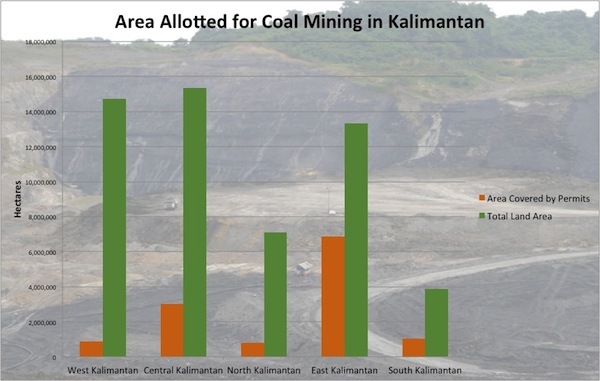 In a joint report with Greenpeace issued in August of this year, JATAM accused Kaltim Prima Coal (KPC) of human rights violations and water pollution. However, KPC did not respond to several requests to visit their mine and did not provide detailed answers to questions. 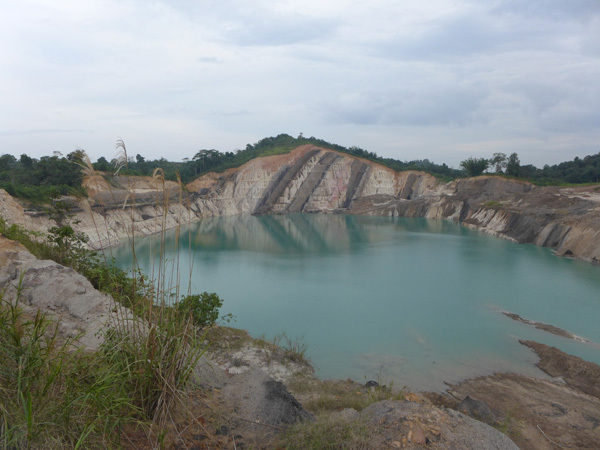 Open pit mining at PT Kitadin coal mine, majority owned by Thai firm Banpu, near Samarinda, East Kalimantan. Photo by David Fogarty, (August 2014). Publicly listed Adaro has a much better reputation among government officials and NGOs, and maintains its operations follow the highest standards. Its main mine in South Kalimantan is one of the largest in the Southern Hemisphere. Working with the KPK and the Supreme Audit Agency, the Ministry of Energy and Mineral Resources and other agencies are focusing on the 12 provinces with the highest numbers of mining permits. The aim is to review the legality of the permits, check if mining companies have valid tax identity numbers, are paying their taxes fully and whether the permits overlap palm oil and other mining concessions and protected forest areas – a common problem in Indonesia. The program also examines the transport and transfer of mining products. To date, the programme has led to the suspension of more than 300 mining permits by local officials, with more expected. The new trade rules state that only coal mining companies that have business permits assessed as clean and clear can export coal. The ministry issues each approved firm a certificate, which the ministry of trade uses to approve an export licence. Exports will also have to go through designated ports. He expected the new trade rules to slow down exports. Weaker coal prices were also having an impact, he said, and this might force some smaller players to the wall. Export coal prices have halved since their 2009 peak. Indonesia also has another tool at its disposal: stringent environmental regulations governing mining practices. But they need much stronger enforcement, government officials, analysts and NGOs say. Companies must submit detailed environmental impact assessments and prepare detailed rehabilitation and post-mining reclamation plans. Companies have to place large deposits into a bank account to ensure they carry out mandatory rehabilitation and reclamation of affected areas. But lack of qualified mining inspectors, lack of expertise at the district and provincial level and, most likely, graft, mean many smaller mines are not inspected as often as they should be, laws aren’t enforced fully and permits are rarely terminated for bad practices. Tjahjono said the ministry was trying to train up more mining inspectors. “The problem is not many engineers are interested in this training,” he said. The lack of oversight of mining permits remains a key issue. In total, the mining ministry says there are 10,992 permits for mining of all types across the country. 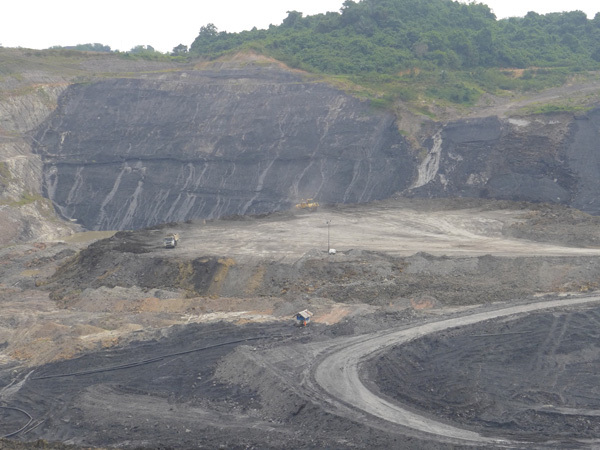 A large coal pit adjacent to Makroman village near Samarinda, East Kalimantan. Villagers say the company has refused to rehabilitate and reclaim the pit and has instead cleared new areas to dig out new coal seams. Photo by David Fogarty. According to a source involved with the KPK-led investigation, these 10,922 permits are owned by 7,834 companies. Of these, 17 percent do not have a tax number. The mining concessions covered by these permits include 26 million hectares of the national forest estate. This “forest” area, some of which is ironically not forested, is managed by the Ministry of Forestry that covers roughly 70 percent of Indonesia’s 191 million hectares of land area. According to the source, the permits also cover 1.3 million hectares of conservation forests, which are no-go zones for mining. In addition, the permits cover five million hectares of protection forest, which are prohibited for open-pit mining, underscoring the growing threat to the nation’s remaining forests. A study published earlier this year found that coal mining was one of the top causes of deforestation, trumped by palm oil plantations, logging and clearing for pulp plantations. The study examined forest loss within industrial concessions between 2000 and 2010 and found that coal mining had caused 300,000 hectares of forest loss versus 1.6 million hectares in oil palm concessions. With more mine development planned, NGOs expect the deforestation rate to only grow. Map showing coal concessions in Kalimantan. Courtesy of JATAM. Map of various concessions across Indonesia. Courtesy of JATAM. JATAM takes a harder line on coal mining than most NGOs. It wants coal mining stopped altogether, an unlikely scenario since the Indonesian government expects domestic coal demand for power generation, currently around 73 million metric tons per year, to double by 2022. “We agree that everyone needs energy. But we don’t want the energy to come from threatening the people, coming from land grabbing. We need to change the mindset of people,” said Johansyah’s colleague, Hendrik Siregar, during a recent interview in Samarinda. JATAM works with local communities under threat from coal mines, advising on legal options and encouraging villagers and farmers not to sell. It’s easy to see why. Samarinda, for good reason, is known as the city of coal mines. About 70 percent of the city and surrounding area is under mining permits and the landscape is littered with the scars of mines and abandoned coal pits, many now filled with water. The majority of people in Samarinda benefit little from mining and it is at the village level the real impacts can be seen. About a 40-minute drive from the city centre is the village of Makroman. Farmers earn a living growing rice and fruit such as rambutans and durians. The village is under threat of being cleared and developed by an adjacent coal mine run by an Indonesian firm called CV Arjuna. About six years ago, a company official came to the village to take soil samples and measurements. This was the first the villagers heard about the company or the planned mine. “He was like a thief,” said farmer Niti Utomo, 66, who, like many of the other villagers, has been resisting CV Arjuna’s efforts to buy their land. Niti Utomo, 66, a rice and fruit grower in the village of Makroman, near Samarinda. He says an adjacent coal mine has ruined local water supplies, causing his crop yields to fall. He says he refuses to sell his land to the coal mining company and that the city government has never listened to his complaints about the environmental damage caused by the mining firm. Photo by David Fogarty, (August 2014). The company began developing its mine several years ago and it now surrounds the village and its farmlands on two sides. Huge pits have been dug to extract the coal, levelling hills and forests and disrupting water supplies for the rice fields. Villagers complain regularly to the city government about the firm’s mining practices but they say the government never listens. 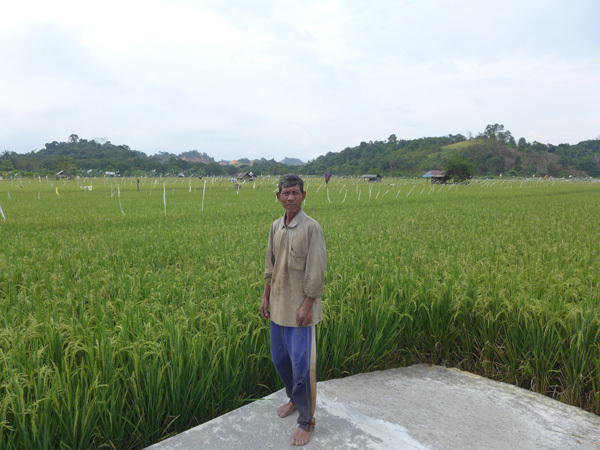 Utomo said he used to get six tonnes of rice per hectare. Now it was more like four. And pests have become a greater problem. Other villagers say the same thing. While the mine has built a dam for irrigation, this sometimes runs dry, leaving the rice crops to wither in the dry season. Ultimately, CV Arjuna wants to acquire all of the 365 hectares in the village and has offered large sums of money to owners, some of whom have accepted. Utomo, who has farmed in the area for more than 40 years, has refused the money. “I will fight till I die to keep the land,” he said as we spoke next to his rice field. In an emailed response to questions, a company official said CV Arjuna’s permit to operate, granted by the city government in 2011, was fully legal. The official provided a list showing the company had met the mining ministry’s clean and clear status and said the company would rehabilitate the large coal pit next to the village. He did not answer questions about why the community was never consulted about development plans for the mine. Of these, about 20 percent were not complying with the government’s environmental regulations, officials said. The situation was not improving. “It’s getting worse, I think,” he added after conferring with his colleague Priyo Harsono, the provincial head of environmental impact assessments (EIAs), during a recent interview in Harsono’s office in Samarinda. A major problem was the quality of oversight at the district level, which issues most of the EIAs. While the quality of the EIAs was generally good, it was the monitoring of mines and enforcement of regulations that was a consistent problem. 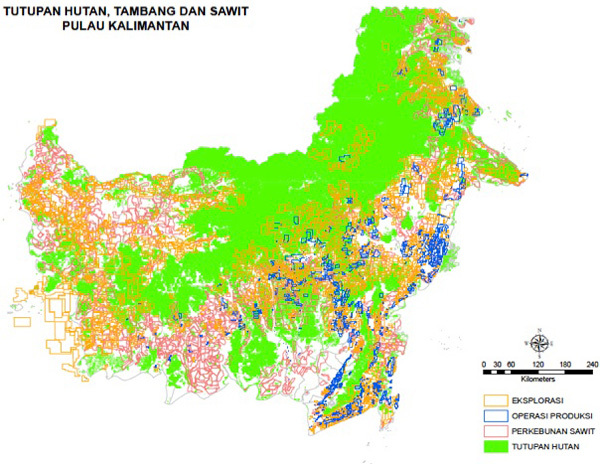 Together, East and North Kalimantan lost 1.7 million hectares of tree cover from 2001 through 2013, representing about 10 percent of its forests. However, some of this data may be skewed by misinterpretation of plantation harvest for forest loss. Still, large tracts of intact forest have been degraded since 2000, with remaining undisturbed forest now located only in the interior of the region. 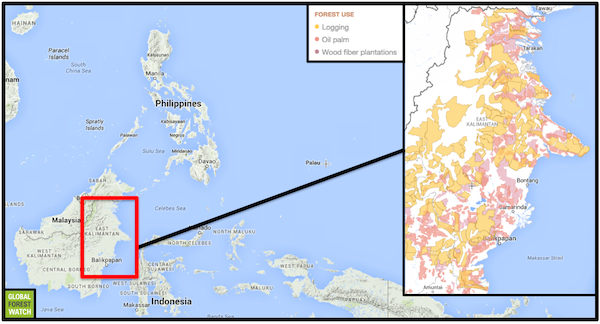 Data and map courtesy of Global Forest Watch. Click to enlarge. In addition to more than seven million hectares allotted under coal mining permits, East and North Kalimantan are riddled with logging, palm oil, and wood fiber concessions. Map courtesy of Global Forest Watch. Click to enlarge. The environmental office has the authority to inspect mines and has six environmental inspectors, Harsono said. They team up with the eight mining inspectors at the provincial mining office to carry out checks, though mines are told in advance of the inspections. Harsono says there are enough inspectors, despite misgivings by NGOs and the mining ministry in Jakarta. Mines are rated according to water quality, how they manage solid and hazardous wastes and particularly whether mines have followed the strict reclamation and re-vegetation of mined-out pits. Companies failing to comply are given warnings and the environmental office can recommend law enforcement action. “We have given the information to the bupati but they haven’t closed the mining,” Harsono said. Abandoned pits remain a big problem in the province, said Guritno, despite mining companies forfeiting sizeable bank deposits set aside in a mandatory reclamation fund. According to government officials interviewed for this story, much of the money isn’t immediately used to rehabilitate abandoned pits and is often diverted for other government expenditures. Harsono said he hoped a new regulation passed in February this year would tackle the problem of abandoned pits. Coal mining companies that want to increase production will have to close and rehabilitate 70 percent of the mining pits before they can expand. The problem, though, will again come down to monitoring and enforcement. “What the government is trying to do is to put stronger controls through the whole system and it’s an element of being a slow process but it is a process that is happening,” said the senior mining executive. 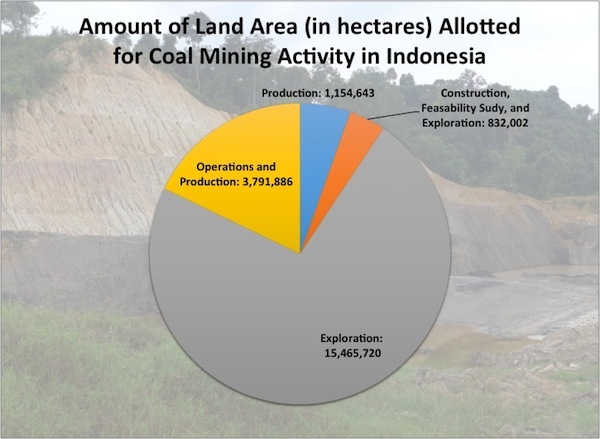 Some, though, question the wider value of coal mining to Indonesia. Greenpeace wants coal exports to wind back back and says coal mining is like a double-whammy for climate change – emissions are produced both from clearing forests and from production of energy in power stations, as well as from operation of steel mills and cement plants. Open coal mining pits can also produce large amounts of methane, a powerful greenhouse gas. “I think coal mining is the silent killer for Indonesia, not only for the environment but also for people,” said Arif Fiyanto, climate and energy campaigner for Greenpeace Indonesia.